For water-based and some other binders in composite systems which are not exposed to strong, long term UV light. Ability’s duro® powder pigment preparations are mixtures of alkaline resistant pure pigments and dispersing agents. In the main, they are expertly prepared, uniform blends of bright, clean organic pigments usually with certain ‘earthy’ more natural looking inorganic mineral oxide pigments. duro® convenience colours provide an interesting and very cost-effective range of colourants for most composite products such as paints and inks. They are the result of intimately blending, in defined proportions, selected bright, strong organic pigments such as phythalocyanine or vat dyestuff blues and phthalo greens, with opaque UV resistant mineral (metal) oxide ‘earthy’ hue pigments such as cobalt blues, chromium oxide greens and iron oxide yellows, reds and blacks. duro® colourants are generally supplied as low dusting powders usually packed in 25kg* net multi-wall paper sacks. These colourants are typically used by blending and dispersing small weight proportions, about 5%-10%, based on the binder weight into liquid and semi-solid composite formulations during manufacture. *On firm advance order, Ability can supply duro® colourants in virtually any pack size and type. Although generally high in lightfastness duro® colours are typically recommended for the colouration of composite materials having water-based or water-miscible binders, such as those used in the manufacture of construction and allied materials / products, with an intended internal, or UV protected exterior, service life such as: Cementitious (cement containing) composites - such as interior concrete floors and plastered walls. For example, concrete, concrete products, mortars, bench tops, GRC (Glass Reinforced Cement) and grouts - including cementitious coatings, floor toppings and floor or pavement screeds used internally. Ability’s duro® colourants are skillfully prepared in unique blending equipment. These special machines have been designed for intimate blending and ideal process control by mechanical and electronic engineering experts. Only the best pigments suitable for attaining preferred customer performance parameters are selected and used. Each manufacturing process from the comprehensive testing of raw materials to the packaging and palletising of the finished duro® pigment product is carefully monitored and supervised personally by our Production Manager and Works Chemist. Stringent quality control ensures that you - the all-important customer - is completely satisfied with our organisation in general and the duro® product in particular. Pigment preparations must be uniform in all respects from batch to batch, shipment to shipment, year to year and we at Ability pride ourselves on our complete product uniformity to specification for your benefit. When a particular duro® pigment preparation is a mixture of pigments which includes a major proportion of mineral (metal) oxide pigment(s), as most of them do, it may, upon exposure to strong or long-term UV light for say 8-12 years, suffer a colour shade change but it will usually never fade completely. duro® convenience powder colourants are designed for ease of use to result in easy mixing and dispersion by simply stirring them into your water-based system. Although different pigment types have different characteristics - particularly with regard to dispersibility - in most cases duro® pigment powders require only a simple, slow speed mixing action to result in an ideal, uniform dispersed state in your product. This easy-to-disperse feature results in the benefit of requiring only the use of simple, low cost, low energy and low maintenance equipment. Thus, the use of duro® pigment preparations results in your products having effective uniform colouration with the minimum of fuss, bother and cost. A standard range of duro® powder colourants are normally available for prompt dispatch ex-stock to anywhere in the world. For your higher volume manufactured products requiring regular use of particular colour shades not attainable from colours in our standard duro® range, Ability can custom manufacture a duro® pigment preparation for you on a firm, advance order basis after your approval of the colouring results. In this case, upon receipt of your official order, we would first promptly prepare and supply you with a free sample for your evaluation. This can then be followed with the supply of a small pilot lot for your production trials at an agreed price. Ability can lower your pigment costs and provide you with the facility of custom pigment blends to reduce your colour inventory. Virtually any cost-effective pigment combination can be provided for you, including pastel shades, incorporating white Titania, in minimum quarter tonne (250kg) lots. duro® colours can be used for tinting - to carefully change the colour of your previously manufactured liquid product(s). Pale pastel tint product shades with large proportions of white as well as deep-tone colour shades with less white can be made or modified/corrected with duro®. This facility provided by the use of duro® in your products can be applied when full masstone or tint product colouration is required. duro® ‘stir-in’ powder colourants can be formulated and customised for you in the most cost-efficient ways. For instance, if you want a low cost-per-kilo drab green colourant for (say) cheap aqueous drum paints or other longer lasting uses, we can provide an easy dispersing duro® pigment blend. 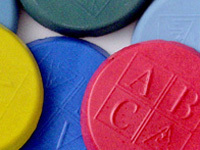 In this instance the blend could consist of a small proportion of blue shade black iron oxide, such as Ability’s abilox® Black Iron Oxide CAF-X2, plus a relatively large proportion of inorganic yellow iron oxide such as abilox® Yellow Iron Oxide CAC (‘920’ type) and perhaps with very small proportions of a suitable bright green shade (beta) phthalo blue pigment and a bright, clean organic greenish shade ‘Hansa’ type yellow pigment. Another example could be a duro® water wetted (to reduce the tendency of fine dry powder pigments to cause dusting into the air) blend of inorganic transparent yellow ochre pigment with a lightfast, heat stable bright transparent organic red pigment for the manufacture of a ‘hard to duplicate’ heat-set red printing ink intended for use on security products such as bank notes. Our knowledgable staff at Ability can provide you with a standard duro® colourant or a unique pigment blend to suit a particular requirement in your operation. For easy-to-use, low dusting powder, duro® colourants suitable for any aqueous binder system, why not contact us now to find out more?